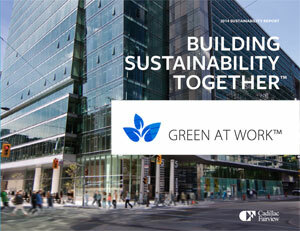 Cadillac Fairview’s Green at Work national sustainability program recently received the Green Award of the Year from the NAIOP Greater Toronto Chapter, rewarding the commercial real estate company’s growing environmental efforts. “Green at Work supports Cadillac Fairview’s portfolio in setting targets, quantifying our consumption reduction annually and sharing our experiences and best practices across our portfolio,” said sustainability director Karen Jalon. Green at Work was launched in 2007 and it requires each property to: form and mobilize green teams for each of its five sustainability pillars (energy, waste management, environmental protection, sustainable procurement and stakeholder collaboration); plan and implement projects to address mandatory tactics per pillar; achieve performance targets; and pursue LEED and BOMA BESt certifications. Cadillac Fairview and its affiliates own and manage more than 36 million square feet of leasable space at 66 properties across North America, and Green at Work targets 2.5 per cent annual reductions in energy and two per cent annual reductions in water usage throughout the portfolio. Its waste diversion targets are 70 per cent for retail, 75 per cent for non-LEED-certified office space and 90 per cent for LEED-certified AAA office space. From 2008 to 2013, Cadillac Fairview reduced energy and water consumption by 16 and 28 per cent respectively, while achieving a 10 per cent increase in waste diversion. The third generation of Green at Work will launch in 2017 and Jalon said it will raise the bar higher through: setting harder energy and water use and waste diversion targets; increasing the sophistication of its responsible procurement process; pushing for stronger collaboration with stakeholders; and putting a greater emphasis on wellness in buildings. “It’s very clearly about helping the planet, but there’s also a strong business value that translates to the bottom line. It increases our asset value in terms of reducing our energy and water spend. It meets the requirements of our clients and ensures that they’re happy in our buildings. * All six towers are certified LEED EB Gold or Platinum and received multiple LEED points for superior indoor air quality. * Energy consumption dropped by 6.9 per cent in 2014, equivalent to the annual use of 1,300 houses, saving $300,000 in base building electricity costs. * Greenhouse gas emissions fell by 13 per cent in 2014, equivalent to the annual emissions of 747 cars. * The waste diversion rate was 78 per cent in 2014. * Over the previous five years, it delivered a 13 per cent reduction in energy use, a 42 per cent decrease in water use and 79 per cent waste diversion. * There were $34 million in capital expenditures in 2014 that provided tenant benefits including business interruption risk reduction, service quality, comfort considerations, health and safety, and efficiency gains. * Sustainable building-wide initiatives such as carpooling resources, electric vehicle charging stations and green procurement practices for cleaning products became well-established. * Eighty per cent of tenants said they’d recommend the property to others. TD Centre is the first commercial property to provide LEED CI (Commercial Interiors) partnerships to tenants to help them achieve LEED status within their spaces on the property by providing resources, support and education to inform clients of the value of such certifications. “TD Centre has an incredible commitment to sustainability and it being the first and I believe the only property to produce a report of this calibre speaks to their commitment,” said Jalon.